If you own a boat, the chances are high that you have invested in a marine VHF radio to use for communication and emergency situations. You can even interrupt marine stereos to deliver important announcements. Marine radios allow you to stay connected on your boat, but even the best radio can use some support. 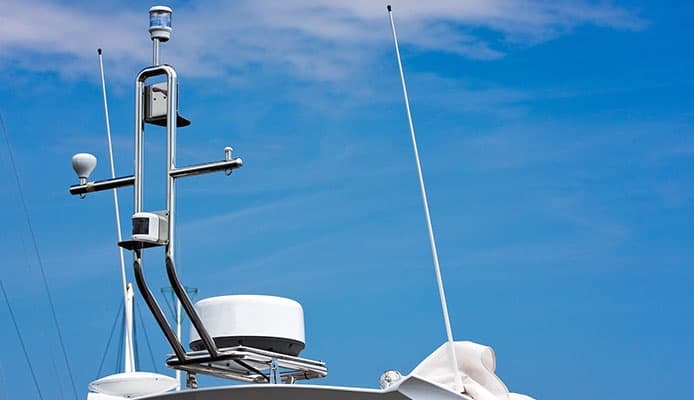 If you want to ensure your marine VHF radio has a reliable connection, you should invest in a top rated marine VHF antenna. All radios need an antenna to function, but the best marine VHF antenna will have your radio functioning at full power with the signals transmitted in the correct direction with the best quality possible. It can be overwhelming to choose a marine VHF antenna and if you don’t know what features to consider before making a purchase, you can be left disappointed with the antenna’s performance. 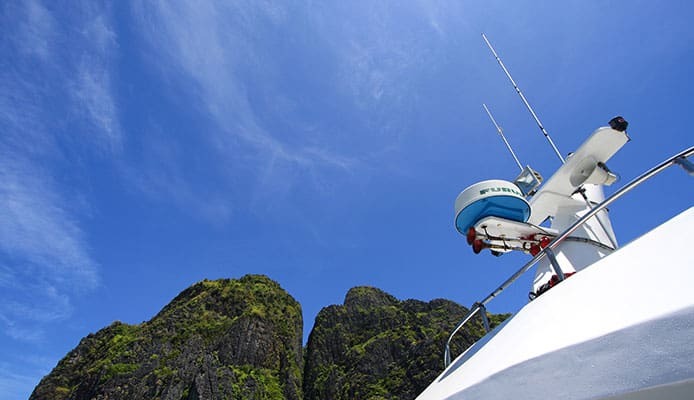 We have made a list of our picks for the 10 Best Marine VHF Antennas in 2019 and included a guide on how to determine what makes a high quality antenna and which you should choose to ensure your boat is ready for the next adventure. This marine antenna is 8 feet long and has a 1”-14 threaded mount. It has brass and copper elements, as well as a chrome-plated brass ferrule. A 15’ RG-58 cable and PL-269 connector are included with the purchase. The suggested mount styles are 4187, 4188-S, or a 4190 ratchet mount. This is a heavy duty VHF marine antenna that features a stainless steel L bracket that can be used to side or mast mount the device. Tram also includes the hardware required for rail mounting. This marine VHF antenna covers all marine-band frequencies. It has a low-loss connector and a coaxial cable included in the purchase. VHF antenna reviews state this model is the “least expensive, good quality model” and offers “great savings”. 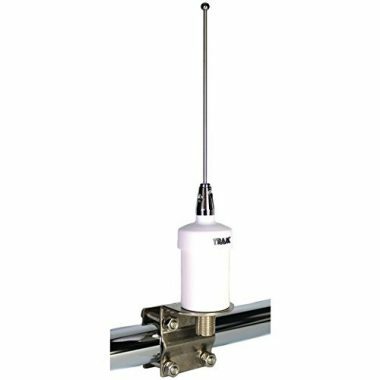 This 35 Inch Marine Antenna by Tram covers all marine-band frequencies. It has a 35 inch stainless steel whip and a base-loading coil. There is a stainless steel L bracket that can be used to side or mast mount the antenna. It has a 6 dB gain, which makes it great for use as a sailboat VHF antenna. This is an excellent sailboat vhf antenna that is made of fiberglass and works with VHF marine radios. It has a slim design and a 34 inch whip that is mounted to a nickel plated post. It has a 1 ½ inch stainless steel coil. VHF antenna reviews state that this model outperforms conventional 54 inch 3 dB gain fiberglass antennas. It is also used by USCG for search and rescue missions. The stainless steel whip has a 17-7 pH and UV resistant cap. Soldered connections and stainless steel housing ensure that it is durable and long-lasting. It has a 250 watt power rating and a ½ wave length shunt fed. It has low radiation, lightning protection, and internal grounding. It also has an O-ring weather seal to ensure to weather can damage the antenna. When it is not in use, it stores easily. This VHF antenna is 4 feet in length and has a 3 dB gain. It also has a 1”-14 threaded mount with a center fed ½ wave coaxial. It has brass and copper elements to maximize the range and a stainless steel ferrule. 20 feet of cable are included in the purchase, as well as a connected. A suggested mount is the Shakespeare style 4187. This antenna band VHF is made of UltraGlass, which is an economical option. It has the same superb electrical performance as the Pro Series Antennas. It is the only marine antenna design in the world that can be removed and remounted on a boat at the user’s convenience. The cable is hardwired, so that you can remove the antenna without pulling or cutting the cable. It is an excellent choice for small to medium sized boats. This antenna is robust, reliable, and good looking. It must be used with. SeaMaster Pro Series Mount, which allows you to mount it on a side, deck, or rail. Pacific Aerials ensures they provide outstanding performance. This antenna is small and extra lightweight. It has a stainless steel whip and L bracket for mast mounting. It has one section and is black in color. It has a gold plated connector. The mounting and coaxial are sold separately. This antenna covers all marine band frequencies and has a 3 dB gain. It is made of heavy duty fiberglass and has stainless steel hardware. It includes a nylon ratchet mount that makes it easy to lay down. There is a cable easy screw off and a connector for small hole installation. 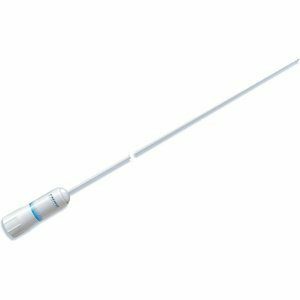 This antenna has a heavy duty fiberglass construction that is suitable for marine use. It has a coaxial cable included in the purchase and an adaptor plate for Sony. It has 3 db, stainless steel hardware, and a nylon ratchet mount for easy lay down. It covers all marine band frequencies. This VHF antenna has 3 feet in length and a 3 dB gain. It has a sealed, tin-plated copper wire coil. It requires a mount with a center hole for passage of the supplied cable. A PL-259 connector is also included. It has a 36 inch stainless steel whip. When it comes to your safety, you want the best. You should spend the time to find the best VHF antenna for your needs and ensure that it has high quality features to deliver a strong and reliable performance. Marine speakers, radios, and antennas are essential to having a safe and fun time on the water. Here, we have some key features in marine VHF radio antenna designs that can determine a high quality antenna from a low quality antenna. By reviewing these features, you can also determine which marine band antenna would be suit your needs. You will want to find an antenna that has a durable construction to ensure it will be long lasting and function properly. The more expensive vhf antenna marine designs will have the best performance. You should try to invest in a high quality construction because they will be made of quality materials and will last longer. Some of the best vhf antennas are made of metal in a fiberglass coating. Others are made of chrome-plated brass elements. The lowest quality would be made of plastic ferrule, which won’t do as great of a job or last as long. The range of the antenna determines how far away the signals from your radio can be sent. The best vhf boat antenna will ensure that your signals are being sent far away without complications. All marine band antennas should tell you their range, which can help you determine if it will suit your needs. The way that you mount your antenna can also affect how far of a range it is able to send signals. 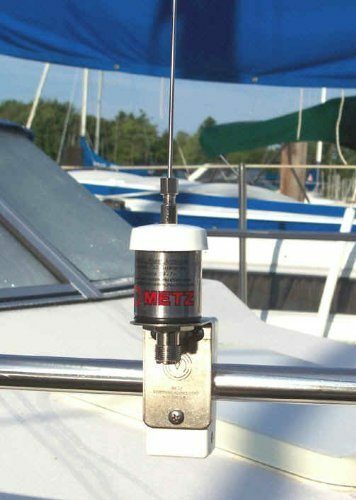 If you are using a sailboat vhf antenna, the higher you can mount the device, the larger the range will be. The gain is also called the dB rating and is an indication of how the antenna focuses its energy. The type of boat or vessel that you have will also determine your gain and the attention you should consider. Higher rated vhf antenna marine designs will have a stronger transmission but won’t be able to send the signal as far horizontally. Lower dB antennas have a broader pattern of radiation, which may get your signal to more places and be helpful in certain situations. Lower dB is mostly recommended for use as a sailboat vhf antenna. This is in correlation with the gain. The decibel rating will determine how far out your signals can be sent. Higher dB ratings tend to have a stronger transmission, but they lose the ability to transmit horizontally. Lower dB ratings are broader, but they signal may not reach as far. Lower dB ratings also work better with transmitting signals along choppy water and rolling waves. Any vhf marine radio antenna should be extremely durable. You want a design that is durable because it will last for a longer amount of time, deliver a stronger and more reliable performance, and be made of materials that can withstand the harsh ocean elements. The best marine vhf antenna will be durable enough to withstand the salt, water, and sun. It should still function properly without complications even after a few years of use. Most marine band antennas are compact in design. The main difference between designs and brands seem to be the height of the antenna. Some antenna designs are rather tall and skinny, much like you would expect an antenna to be. Other designs are more stout and shorter, which makes them have a lower profile. Other designs are a digital VHF antenna, which ensures all signals are correctly broadcasted. The height of the antenna will determine the range of sound that your antenna can pick up. A higher antenna will be able to receive an original transmission better because it will rest above a lot of obstacles. This means there are less obstacles to get in the way of the signal as it reaches your antenna. 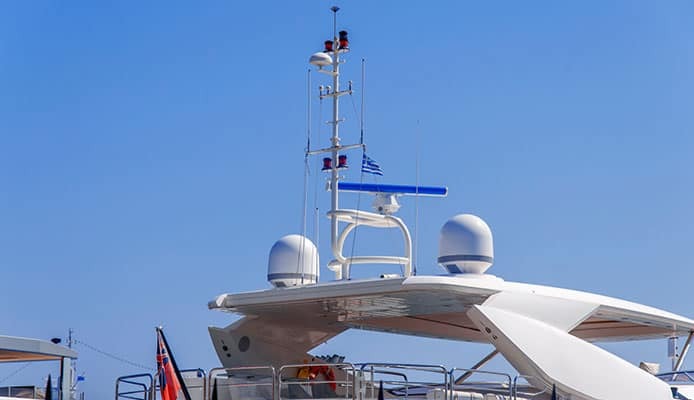 All antennas should be mounted at the highest possible location on your boat or vessel, which can help ensure that it receives the best signal. The longer the design of your antenna is and the higher it is mounted, the clearer the transmission will be. However, taller boats like a sailboat vhf antenna are normally mounted high enough that the actual antenna itself does not need to be an extremely tall design. Instead, the height of the sailboat would deliver what’s necessary to receive transmissions. Sailboat vhf antennas can be shorter in design, if they are mounted at the proper height. On the other hand, a short and compact boat would need an antenna that is tall in its design. Cable loss dictates that for every foot of cable used, the signal strength is lost. Cable that are shorter in length, about 10-20 feet, should not have any problems. However, cables that are 100 feet on a small boat, like a sailboat, can cause problems. In this situation you could lose up to 80% of your signal. The best you can do is keep your cables as short as possible and use the largest diameter possible. Though, cables will add weight to your boat or vessel, so you should be sure that you’ve accounted for the weight of the vhf boat antenna system and its cables in correlation to your boat and its size. This will be dependent on the brand of your VHF antenna. Not all marine VHF antennas will be sold with the same accessories. 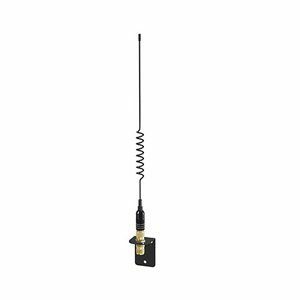 You can check before you purchase on the box, website, or brand information, what comes with your VHF antenna. Brands should include whether a mounting kit is included with the purchase or needs to be purchased separately. Q: What are the benefits of a VHF antenna? A: All radios need an antenna to function. The best marine VHF antenna will help boost the signals of your radio, sending them further out, and with less disruptions. The VHF antenna will boost your radios signals, even over rough water, to ensure that your message is received. VHF antennas are used to keep you connected to the outside world when you are out on the water. Q: How to mount a VHF antenna? A: As stated, you will want to mount your VHF antenna in the highest point possible. However, you can attach your antenna to a rail or use a flange mount to lock it in place on a vertical or horizontal location. Some can even be ratcheted onto a sloping surface. If you have a sailboat, the best place to mount your VHF antenna would be on the mast. You should keep your VHF antenna away from other antennas and it should be kept a minimum of three feet from your VHF radio. You will have to determine before you make a purchase whether a mounting kit is included with the purchase of your VHF antenna. If it is not, the same brand or manufacturer should have a mounting kit available for separate purchase. Q: Is a VHF antenna necessary? A: No, but it certainly helps. A marine radio should have a small antenna built into its design, but the distance of its antenna is significantly smaller than that of a VHF antenna. A VHF antenna may not be necessary, but it really should be. A marine radios antenna is not strong enough to transmit signals far distances and may not be reliable in choppy waves or rough weather. A VHF antenna will boost your signal further out and connect you to the land and other vessels. It’s safer to have a VHF antenna and can be extremely helpful in emergency situations. It’s important that you understand that everything on your boat from the marine GPS systems to your radio and antenna, will function off of marine batteries, which should be installed in your boat. For extra protection, consider investing in marine battery boxes and marine battery chargers to keep you safe, even in emergencies. All You Need to Know About Boating Safety is also a great resource before you hit the water. 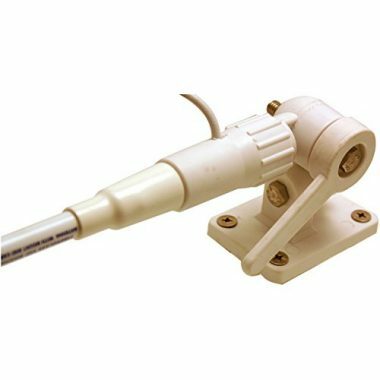 When it comes to your marine VHF antenna, you want durability and reliability. The best VHF antenna will have your messages sent far and wide, ensuring that you are always able to communicate for help or assistance. A VHF antenna is a great investment to pair with your VHF radio and will have you confidently cruising the seas. If you know what you are looking for, you can save time and money by finding the best marine VHF antenna for your boat! Do you own one of the marine VHF antennas that made it onto our list? Let us know how it has worked for your outdoor needs in the comments section below.